Objective-based TIRF microscopy 의 선도주자인 OLYMPUS는 multicolor TIRF 분야에서 중요한 도약을 발표하였습니다. 올림푸스 cell^TIRF 광원은 동시에 일어나는 이미지캡쳐를 위한 4개의 전동 채널들을 제공합니다. 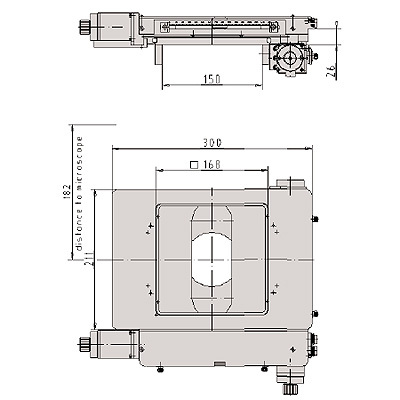 TIRF 매개변수들의 직관적인 소프트웨어 제어는 widefiled 형광과 TIRF 각도 및 끊김없는 이동의 즉각적인 설정과 확정을 가능하게 합니다. Cell^TIRF 광원으로 각 레이저파장은 최적으로 포커싱되고 각각의 각도는 개별적으로 설정, 다른 파장들이 같은 penetration depth를 가질수 있게 합니다. 사용자는 한번의 마우스 클릭으로 모든 레이져들의 계산된 penetration depths들을 미리 설정할 수 있습니다. 시스템은 개별적으로 모든 채널들로부터 TIRF 정보를 동시에 캡쳐하도록 각 레이저의 각도를 조절합니다. Epi-Fluorescence Light source 100W Mercury, 75W Xenon, Metal halide. 철 내의 비금속 개재물은 깨지기쉬움(brittleness) 및 광범위한 크랙(crack) 형성과 같은 위험하고 심각한 재질 결점을 유발 할 수 있습니다. 비금속 개재물은 sulfidic 혹은 oxidic 성분으로 용해(melting) 공정에서 발생됩니다. 모든 철강들은 많거나 적은 양의 비금속 개재물을 포함합니다. 이러한 비금속 개재물들의 타입 및 출현은 철의 타입, 용해 공정 및 완성 제품의 잉곳(ingot) 혹은 주조라인 (casting strand)의 형상과 같은 요소에 좌우됩니다. 이것은 철이 얼마나 순수한지를 판단하는 특별한 의미입니다. 이것은 sulfidic 및 oxidic 비금속개재물 존재량에 대한 정보를 제공합니다. 올림푸스 자동 필터 분석 시스템 “Filter Inspector”은 필터상의 잔여물을 파악하고 분류하는 미국 및 국가 표준들의 다양한 요구에 부합하기 위해 개발되었습니다. 이 시스템은 2분 이내에 자동적으로 필터(일반적으로 47mm 직경)를 스캔하고 분석 합니다. 잔여물의 광학 이미지가 생성되고 ISO및 USP 표준에 부합하는 보고서 형식에 카운트/분류/문서화 됩니다. 이 과정은 빠르고 오퍼레이터의 실수를 최소화합니다. 필터 분석은 다음과 같은 어플리케이션에서 사용됩니다. 윤활제의 오염 결정, 유압 유체(hydraulic fluids), 연료, 디젤 배출 내의 탄소 미립자 (carbon particulate) 그리고 엔진 블록, 트렌스미션(transmissions), 캠샤프트(camshafts) 와 크랭크샤프트 (crankshafts)내의 잔여물을 모니터링. 오염 물질의 특성에 대한 이러한 의무 규정들은 산업의 각 지점에 해당하는 표준에 상응하여 정의되어 있습니다. 허용할 수 있는 잔류물의 양은 매우 광범위하게 고려됩니다. 청정도는 많은 산업, 제약 및 의료 장비 분야에서 매우 중요합니다. 청정도는 모든 제품 공정과 기술 구성요소의 기능 생명 주기에 영향을 미칠 수 있으며 모든 제품은 잔여물과 입자 검출에 대한 특정한 요구 사항을 가지고 있으므로 궁극적으로 제품 및 생산 공정의 품질 개선을 위해 사용될 수 있습니다. 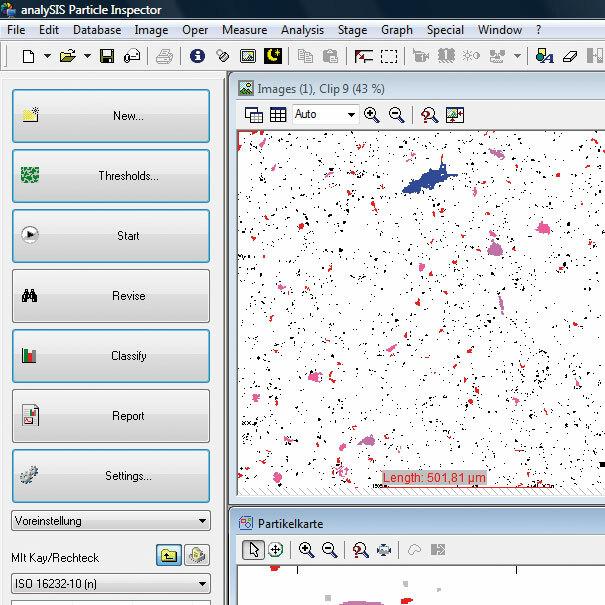 올림푸스 “Particle Inspector” 는 완전히 자동화된 입자 분석, 분류 및 문서화에 대한 포괄적인 시스템입니다. 이 시스템은 현미경, 디지털 카메라 와 컨트롤러를 포함한 전동 스테이지 그리고 입자 분석 소프트웨어로 구성되어 있습니다. 입자의 임계값 기반의 평가는 입자의 영역, 크기, 형상, 위치, 밀도와 휘도와 같은 입자의 특정한 측정 항목을 제공하며 제한되어 선택된 영역 및 개체 분류로 평가할 수도 있습니다. 프레임 독립 검출은 복잡한 데이터 설정들을 최소화하면서 필드 밖의 입자들을 합쳐 주고 정확하게 정량화 합니다. 또한 올림푸스 자동화 필터 검사 시스템, 자동화된 입자 분석 시스템은 여러 가지 스캔 경로 및 예측 포커스 지도 정의 뿐만 아니라 추가적인 측정 항목들도 고려합니다. 현미경은 BX 정립형 현미경 (고 분해능 및 1마이크로미터보다 큰 작은 입자의 인식을 위해서) 과 SZX 연구용 실체 현미경 (큰 입자 및 빠른 검사를 위해)을 사용합니다. 병리선생님들의 업무의 효율성과 권익을 보장할 수 있는 최상의 디지털 슬라이드 솔루션을 제공합니다. Virtual Microscope란, 진단용 유리슬라이드를 200, 400, 1000배의 고해상도 디지털 이미지로 스캐닝하여 컴퓨터를 통하여 진단 및 실습에 활용할 수 있도록 하는 가상디지털현미경으로, 인터넷이 연결된 곳이면 언제 어디서든 현미경 이미지를 확인 할 수 있는 장비입니다. Find out for yourself how efficiently you can work with the ‘virtual slides’ generated using .slide. Check out the sample database online to gather your own impressions of the system under routine conditions. · 데이터 압축은 어떠한 시간 지연 없이 스캐닝 프로세스 중에 진행됩니다. 고 품질및 고 압축을 선택할 수 있습니다. on the part of the manufacturer. 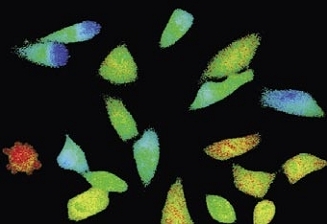 Microscopy in bioscience has progressed from the purely structural characterisation of ﬁxed cells towards the investigation of processes in living cells with recent advances in ﬂuorescence technology. Static morphological observation can now be complemented by the characterisation of the 3-D architecture of cellular structures and the real-time investigation of dynamic molecular processes in living cells. Newly developed ﬂuorescence methods such as TIRF and FRET microscopy or GFP labelling are pushing the frontiers and widening the scope of bio-imaging. 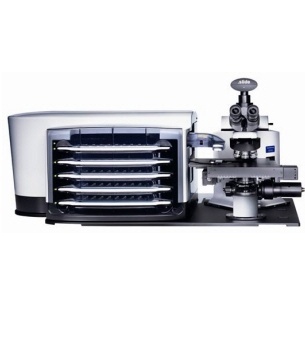 Dynamic processes such as cell growth, metabolic transport and signal transduction are monitored routinely nowadays. The duration of such processes may vary from the sub-second range to hours or even days. Consequently it may be necessary to take several images per second or just one image every couple of minutes. 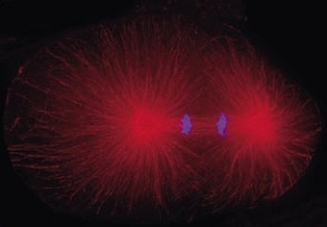 Cell division in the early C. elegans embryo, microtubules in red, DNA in blue. Courtesy of K. Oegema, T.Hyman group, Max-Planck Institut, Dresden, Germany. Microscopy is basically a two-dimensional observation technique while biological samples are three-dimensional. 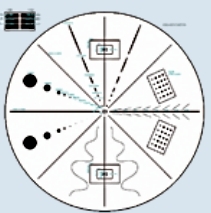 Therefore, in order to map the entire volume of the specimen, it can be imaged in layers by moving the focal plane in precise steps using a motorised Z-drive or a piezo-electric objective drive. quantiﬁcation and analysis of changes in ﬂuorescence intensity are thus an indirect means to study important physiological processes. 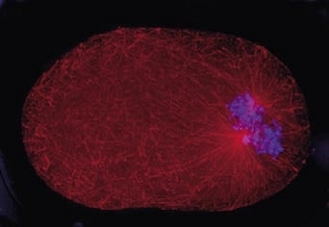 Time-lapse imaging:Fura2-labelled HeLa cells stimulated with APT. 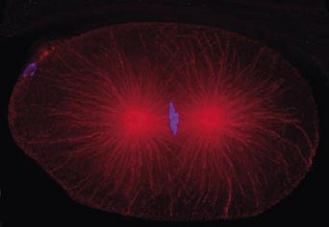 Top : dual-excitation image; below; false-color ratio images revealing increasing calcium concentration. The measurement of ﬂuorescence energy transfer from a ﬂuorochrome molecule to an adjacent one can be used for the investigation of molecular interactions in cells. It requires the acquisition of images with different excitation and emission wavelengths and sophisticated correction algorithms. 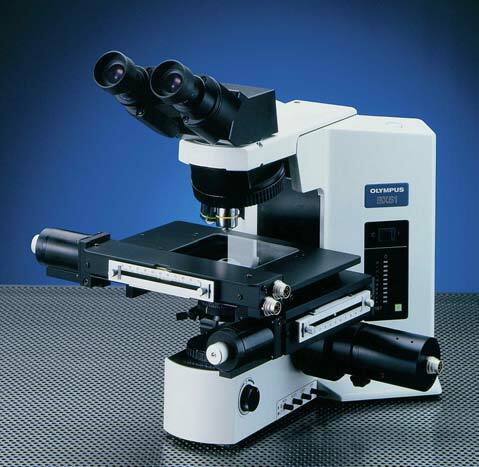 Investigating surfaces without interference from background light can be carried out using Total Internal Reﬂection Fluorescence Microscopy. 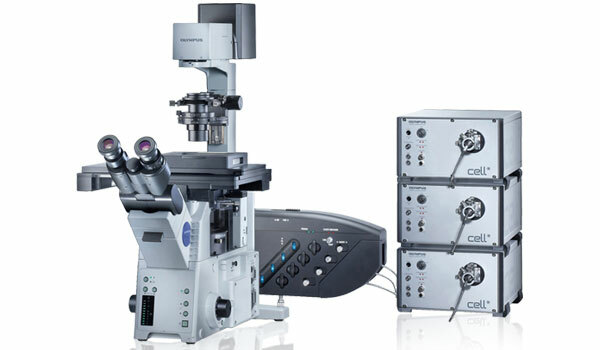 Laser light coupled together with the standard ﬂuorescence excitation allows fast switching between TIRF and wide-ﬁeld ﬂuorescence applications and can even support simultaneous observation. 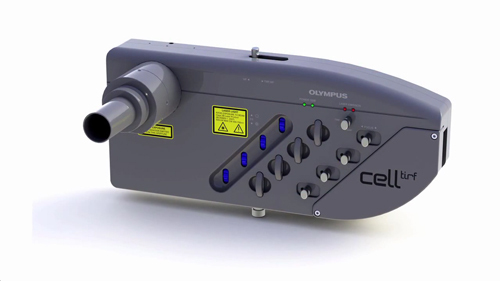 cell^tool TIRFM is based on a modular multi-port illuminator for up to three lasers and a MT10 or MT20 widefield fluorescence light source. 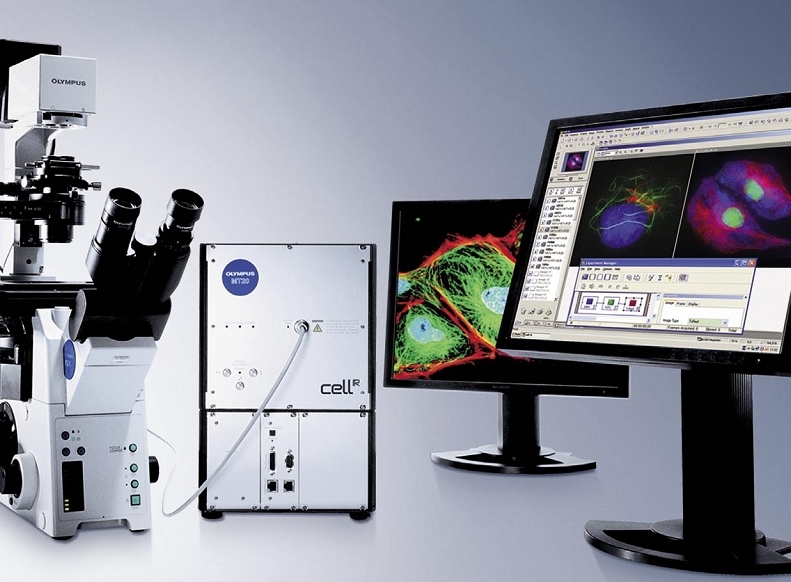 This extension of the cell^M and cell^R imaging stations allows for laser based high resolution cell surface and membrane studies with the possibility of simultaneous widefield observation. 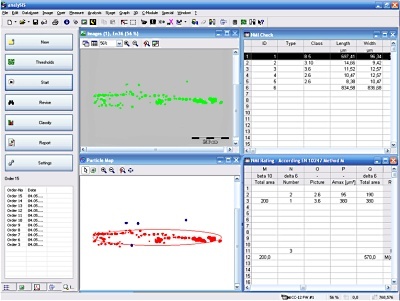 The control of the TIRFM illuminator is integrated into the ‘Experiment Manager’ of cell^M and cell^R software, so in addition to highest quality TIRF observation cell^tool TIRFM offers all the powerful options of the cell* imaging stations. The cell^tool TIRFM is available as a complete turn-key solution or as an add-on for existing cell^M or cell^R imaging systems. Commencing as a challenging problem in physics with the first detection of a single fluorescent molecule in condensed phase at temperatures of liquid helium single molecule fluorescence detection has diversified into a collection of methods applied in various scientific disciplines. With the advent of ultra sensitive detectors and optical instrumentation and by combination with confocal and TIRFM techniques single molecule detection developed into a feasible approach in life science. Decisive for this adaptability is the possibility to detect single molecule fluorescence at room temperature in solution (e.g. FCS) or on surface membranes of even living cells (TIRFM). 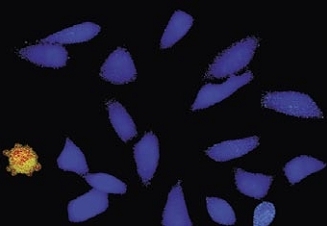 Single stranded RNA hybridised to a complementary biotinylated DNA, which was immobilised on a BSA-Biotin-Streptavidin coated cover glass. The RNA was mono-labelled with Cy3. Imaging of single molecules was confirmed by single step photo bleaching of the dye. Emission intensity plotted versus time decays immediately after bleaching a single dye molecule (ROIs 2-5), contrary to a group of fluorescent molecules whose emission would decrease in a multistep exponential manner (ROI 1). Figure 1: Fluorescence intensity (colour coded. Circles mark five regions of interest (ROI). Each ROI (except of ROI 1) contains one single fluorescent molecule as verified by single step photobleaching: See movie with fluorescence intensity recorded over time (to download the film click on figure 1) and corresponding emission intensity curves plotted vs. time for the selected ROIs (Figure 2, bottom of the page). TIR is an optical phenomenon. If light is travelling through a medium with a high refractive index and strikes the interface of an optical medium with a lower refractive index at an angle greater than the critical angle, the incident light will undergo total internal reflection. Under these conditions some light still enters the low refractive index medium as an electromagnetic wave termed the evanescent wave. The intensity of this wave decays exponentially with penetration depth. The average z-expansion is less than 200 nm depending on the wavelength of light, the incident angle and the refractive index of the media. 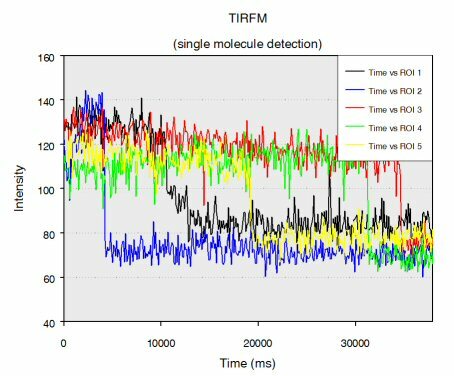 In TIRFM, fluorophores in the sample at a maximum distance of ~100 nm from the coverslip surface are selectively excited. This z resolution of 100 nm is one-fifth of an optical section obtained with a laser scanning confocal microscope. 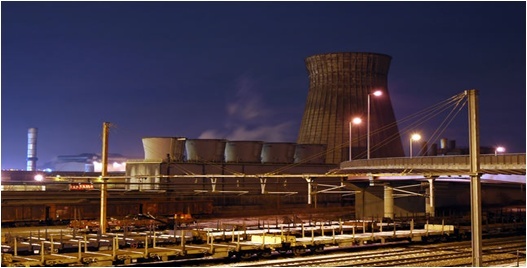 Therefore TIRFM is ideally suited for the observation of processes and structures on or close to the cell surface. Total internal reflection (=TIR) is an optical phenomenon. If light is travelling through a medium with a high refractive index and strikes the interface of an optical medium with a lower refractive index at an angle greater than the critical angle, the incident light will undergo total internal reflection. 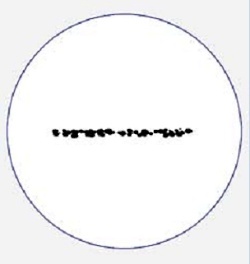 In biological investigations involving living specimen, these prerequisites are met if a laser beam travels through glass, for example a microscope slide (refractive index n = 1.52), towards an aqueous buffer solution or cell surface (n = 1.33 – 1.38). The beam is totally reflected at the interface between the glass and the medium or the cell surface respectively. But the reflected light generates an electromagnetic wave termed the evanescent wave which enters the low refractive index medium. The intensity of this wave decays exponentially with penetration depth along the z-axis. 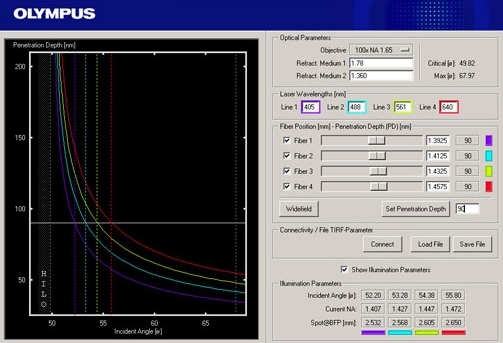 The penetration depth depends on the wavelength of light, the incident angle and the refractive index of the media. The thickness of the optical section that generates fluorescence under TIR can be adjusted by changing the incident angle and has a range between a few hundred and 50 nm at minimum. 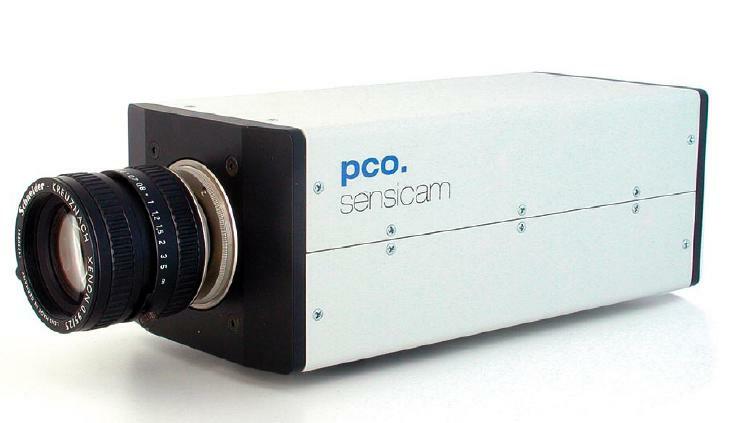 That is up to one-tenth of an optical section obtained with a confocal laser scanning microscope. Thus in TIRFM, fluorophores close to the coverslip surface can be selectively excited. As in confocal microscopy background fluorescence is nearly absent in TIRFM, because the fluorophore excitation is restricted to the focal plane of the objective. Therefore TIRFM gives high-contrast images of the cell surface with excellent signal-to-background ratio and is ideally suited for the observation of processes and structures on the cell surface and within or close to the plasma membrane. 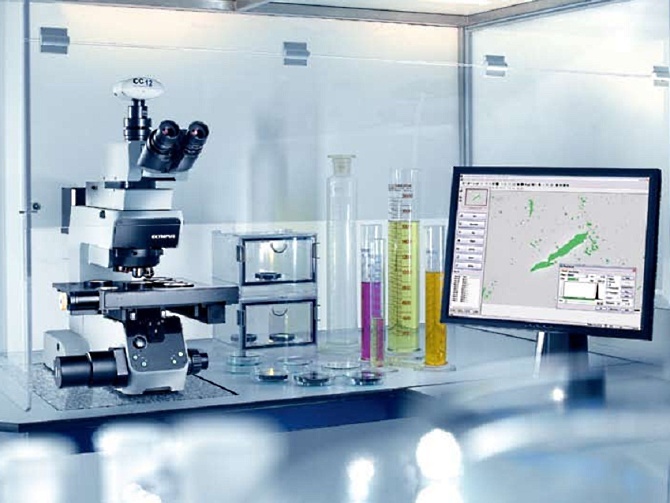 In contrast, widefield fluorescence microscopy provides limited spatial resolution in z-direction because background fluorescence from outside the focal plane often impedes the detection of small or weakly fluorescent structures. 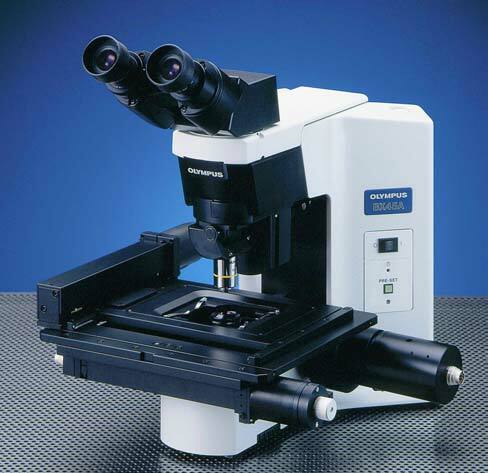 TIRFM does not require the rather expensive scanning microscope technique because it generates widefield illumination at the specimen surface. 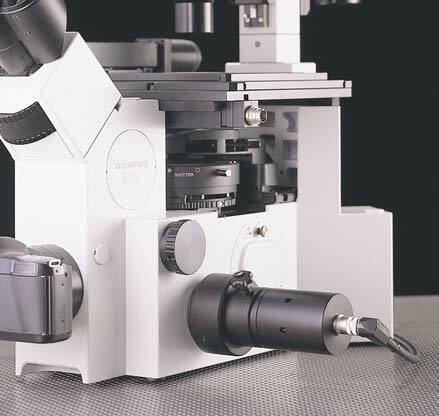 It can be performed relatively cost-efficient with inverted fluorescence microscopes equipped with a special episcopic fluorescence illuminator, special high NA objectives and a laser. Confocal microscopy has the clear advantage in not being restricted to the optical section directly adjacent to the coverslip/specimen interface. 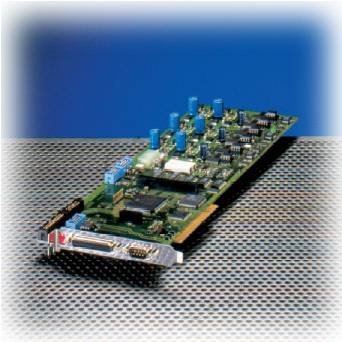 However optical sections obtained by TIRFM can be up to one order of magnitude thinner than by confocal microscopy. 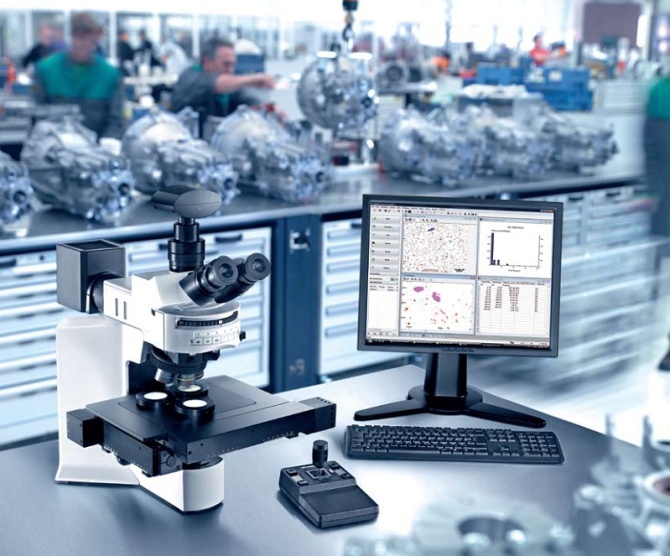 Further-more, being a widefield technique, TIRFM comprises the considerable advantages of a higher acquisition speed as compared to scanning microscopy. 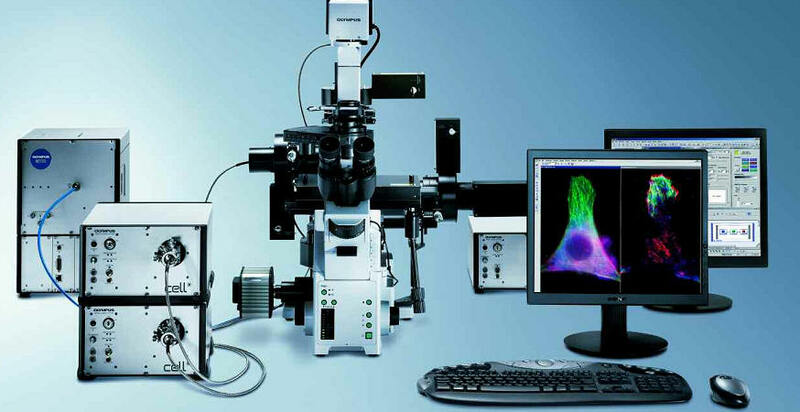 TIRFM is a widefield microscopy technique and consequently modified fluorescence microscope set-ups are used. 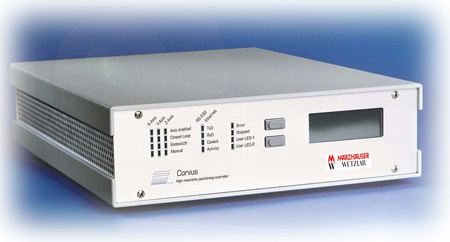 Lasers are commonly employed as illumination sources because the light is coherent, polarised, intense and well collimated. 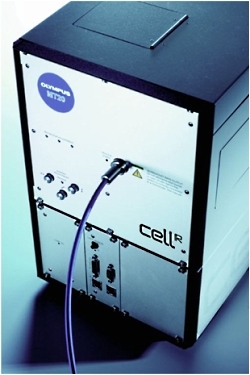 If a special dual port epi-fluorescence condenser is used the change from widefield illumination with a standard arc lamp to the TIRF laser is rapid and straightforward and does not interfere with the beam alignment. 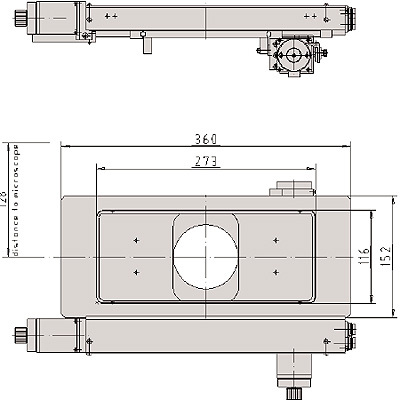 For TIRFM with inverted microscopes, the incident beam is focused off-axis at the objective back focal plane such that it passes the very periphery of the pupil of a highly refractive objective. The objective’s numerical aperture must be at least 1.38 to exceed the refractive index of a living cell. Thus the incident beam emerges from the front lens into the immersion oil in such a way that it reaches the glass/cell interface in a critical angle and undergoes total internal reflection. The off-axis position of the laser beam determines the incident angle and the depth of the evanescent field accordingly. The further off-centre the alignment is, the larger is the angle and the shallower is the evanescent wave. 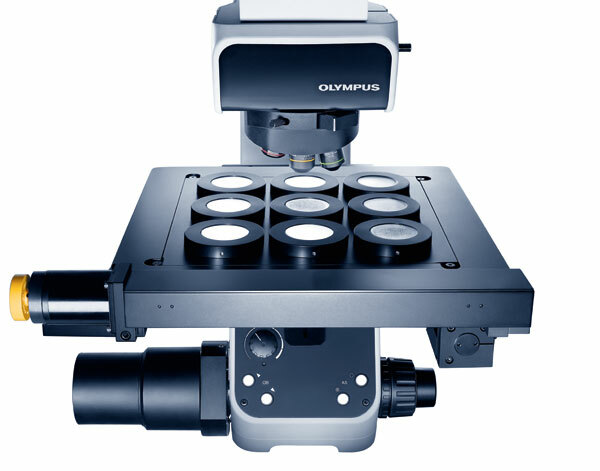 Olympus offers a range of special TIRF objectives with very high numerical apertures (NA). 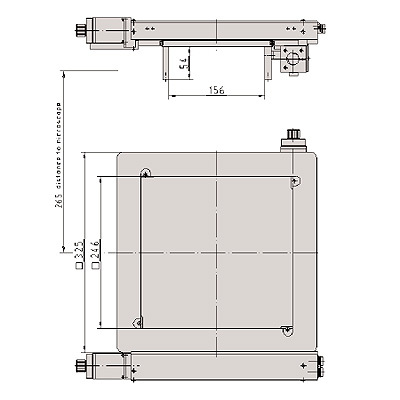 There are three objectives available with a NA of 1.45 that can be used with conventional immersion oil and cover slips. With the PLAPON60xO/TIRFM-SP, the PLAPO100XO/TIRFM-SP or the new UAPO150xO/TIRFM-SP a penetration depth of the exciting wave around 100 nm is reached. 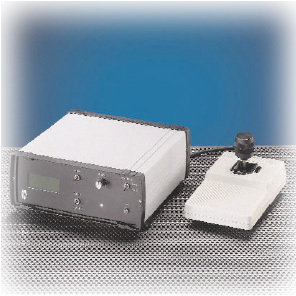 The UAPO150xO/TIRFM is especially designed for single-molecule detection in TIRFM. 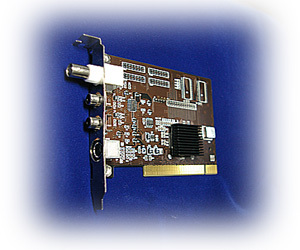 The APO100XOHR features an unsurpassed NA of 1.65. To match the extreme high NA special high-refraction cover slips and special immersion liquid (diiodomethane) are required. 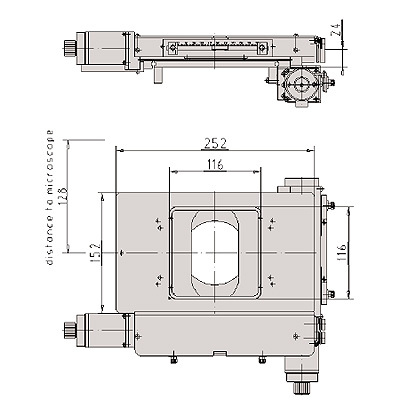 Therefore the objective offers a unique short penetration depth of about 50 nm and high flexibility regarding the marginal angle available for TIR. 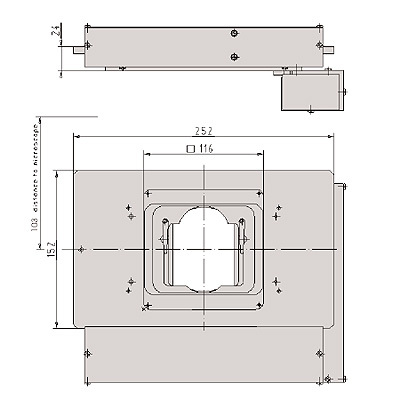 The 60x and the 150x objec-tives have a temperature correction collar. Common plan apochromatic objectives like 100x with NA = 1.40 can also be employed for TIRFM, but they are less convenient due to the small angle that is available for the total internal reflection. 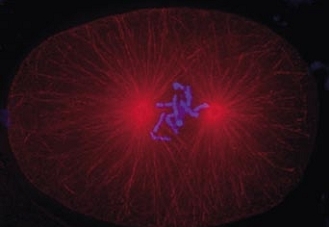 The visualisation of molecular interactions on surfaces is of fundamental interest in cell and molecular biology because many molecular transport and signal transduction processes are transmembrane incidents. Examples are binding and triggering of cells by hormones, neurotransmitters and antigens, cell adhesion to surfaces, electron transport in the membrane, cytoskeletal and membrane dynamics, cellular secretion events and vesicular fusion events with membranes. TIRFM is the perfect tool for visualisation of these processes. The extraordinary small depth of field of TIRFM assures that only surface-bound fluorophores are detected. Fluorophores in the surrounding medium remain invisible though they might be in rapid exchange and be present in large excess. This is different from normal widefield illumination where they would create overpowering background fluorescence. 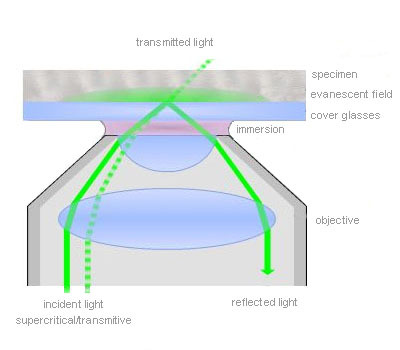 During many experiments it might be desirable to switch rapidly between TIR illumination to observe the surface and standard epi-illumination to investigate the deeper layers of the specimen as well. For example, a transient process may involve simultaneous but not identi-cal processes in the membrane and the cytoplasm. 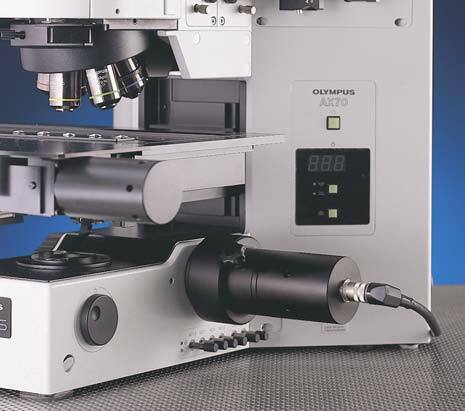 The Olympus BioSystems dualport illuminator for combined TIR and widefield illumination allows the fast and synchronised alternation of the two techniques. 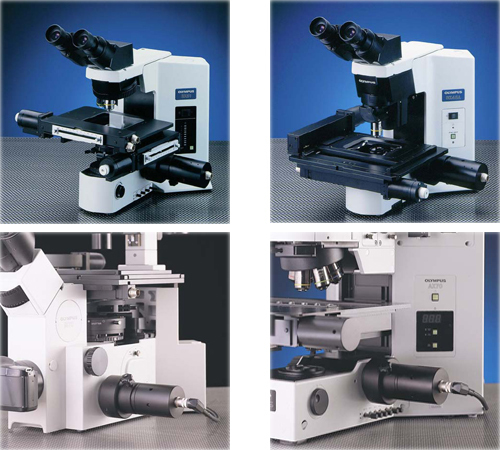 The techniques of TIRFM, DIC and other microscopy techniques as FRET, FRAP and FLIM can also be combined. Cell 시스템에서 가장 중요한 장치 중 하나인 광원 장치는 MT20 광원 시스템을 사용합니다. MT20 광원 장치는 두 가지 타입의 램프 (Xeneon 혹은 Xe/Hg)을 사용할 수 있으며 전원 장치가 내장되어 뛰어난 광량의 안정화를 이루었습니다. 또한 내장된 8개의 필터 장착 휠은 고속의 회전으로 즉각적인 필터 변경을 가능케 하며 14단계의 광량 감쇄기 휠 뿐만 아니라 1ms의 고속 셔터도 지원합니다. 시편의 Bleaching 감소를 가능하게 합니다. 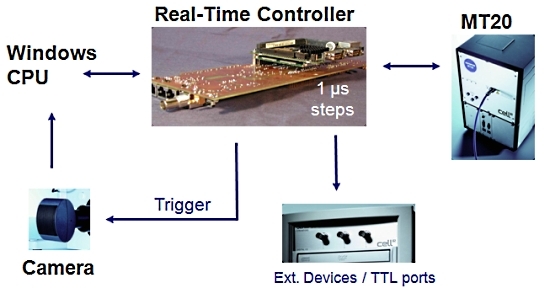 Cell 시스템에서 또 하나의 매우 중요한 장치로 이미징 워크스테이션 내의 실시간 제어기 (real time controller)보드가 있습니다. 이 실시간 제어기가 광원 장치, 카메라 및 현미경의 제어를 실시간으로 하드웨어적인 처리를 제어 함으로써 시편의 Bleaching을 극소화 할 수 있습니다. 또한 Time point 기반의 실험에서 1us 단위의 매우 정확한 Time point를 보증할 수 있게 하여 분석 결과의 신뢰성을 높여 줍니다. 위의 처리 순서 비교 이미지를 보면 셔터 개폐 시간 10ms, 카메라 노출 시간 50ms, 카메라 Readout (데이터 전송) 시간 80ms, 필터 교체 시간 50ms 기준으로 두 시스템간의 차이를 비교 한 것입니다. 일반적인 순차 처리 방식의 시스템의 경우 PC에서의 지연 시간 및 필터 교체등에 의한 진동의 영향을 받게 됩니다. Cell 시스템은 실시간 처리기를 사용함으로써 일반적인 순차적인 제어가 아닌 병렬적인 동시 제어가Hardware적으로 가능함을 알 수 있습니다. 이는 더 장시간의 더 많은 이미지를 Bleaching이나 Cell Dead가 없이 정량적 분석이 가능함을 나타내며 동일 조건시에 더 많은 노출 시간을 확보할 수 있음으로 카메라의 영상 품질의 향상 역시 기대할 수 있습니다. 위 이미지에서 샘플에 형광 Excitation이 노출 되는 시간을 비교하면 A의 경우 170msec, B의 경우 50msec 로 1/3 이하의 노출 만으로 동일한 조건의 이미지를 획득할 수 있게 됩니다. ※ Solution Systems 제품입니다. 클릭하시면 자세한 내용을 확인하실 수 있습니다. 스테이지 컨트롤러 CORVUS는 스테이지를 위한 모션 컨트롤의 새로운 표준 영역을 설정합니다. 스텝 모터 제어에 대한 고급 기술들과 함께 최신의 기술이 합쳐져 CORVUS를 지금까지 도달 할 수 없을 것이라 믿었던 스펙을 달성할 수 있었습니다. 분해능(최소 단일 스텝 크기)은 거의 1.5nm (0.0015 um)이며 CORVUS를 사용하여 스테이지를 이송할 수 있는 최저 속도는 초당 0.015um 입니다. 32비트의 고성능 RISC 프로세서, 실시간 연산 시스템을 지원하며, 또한 최고 이송속도를 초당 180mm (4mm lead screw pitch)이며 가장 복잡한 프로그램일지라도 정확한 연산을 매우 빠르게 수행할 수 있게 합니다. 새로운 22개의 LED 진단 시스템을 이용하여 단번에 컨트롤러의 상태를 파악할 수 있습니다. 가장 주목할 만한 것은 ETHERNET과 TCP/IP 인터페이스 옵션입니다. 컨트롤러는 리눅스, 맥 혹은 윈도우 기반의 어떠한 인터넷 브라우저를 통해서도 컨트롤 할 수 있습니다. 원격 유지 보수나 오퍼레이션이 거짓말처럼 가능합니다. 웹서버 버전의 CORVUS는 오퍼레이터 패널이 직접 컨트롤러 그 자체에 내장됩니다. 매우 정밀한 완전한 포지셔닝을 요구하거나, 에러 correction을 제공하여 매우 유용한 어플리케이션에 적합합니다. 1 회전당 50,000 단계의 분해능으로 LSTEP 스테이지 컨트롤러는 스테이지를 정밀하게 그리고 부드럽고 민감하게 제어할 수 있습니다. LSETP 은 오늘날의 거의 모든 이미지 프로세싱 시스템과 사용자 환경의 WIN-COMMANDER 소프트웨어와 호환됩니다. WIN-COMMANDER 풀 버전의 경우 시편이나 작업 구역에 자동적으로 구불구불한 (meandering) 추적을 가능케 하며 저장된 위치들을 반복 이동할 수 있는 옵션을 제공합니다. 스테이지 컨트롤러 LSTEP은 모든 스텝 모터 Marzhauser 시스템에 적합합니다. 동적인 마이크로 스텝 운전 방식과 모터의 1회전당 50,000 마이크로 스탭의 해상도는 200-스텝 모터를 최대 초당 40회전을 달성할 수 있게 합니다. 모터들의 동작 특성은 대단한 정밀도와 스무드한 동작을 보장하면서도 놀랍도록 조용한 스테이지 운영입니다. 포지셔닝 시스템은 조이스틱을 통한 단독 운영 모드가 가능하고 스테이지의 자동화된 포지셔닝 및 모니터링을 위한 PC사용도 가능합니다. 조이스틱은 컨트롤러와 함께 제공되며 옵션 아이템으로 LSTEP의 앞 패널에 위치 디스플레이를 제공합니다. LSETP 스테이지 컨트롤러는 오늘날의 대부분의 이미지 분석 패키지와 호환됩니다. 이 컨트롤러를 자신의 소프트웨어에 통합하고자 하는 사용자들을 위해서 완전한 명령어 셋트를 가진 DLL을 제공합니다. 컨트롤러는 편리한 유저 인터페이스를 가진 WinCommander 기본 버전을 제공합니다. WinCommander Full 버전 (제공되지 않음)은 시편의 자동화된 구불구불한 (meander) 추적 뿐 아니라 정밀한 좌표상의 위치를 마킹하고 포지셔닝할 수 있습니다. 포지셔닝 시스템 LSETP-PCI는 2/4 상(phase) 스텝 모터에 대한 3축 스텝 모터 컨트롤러로 개인용 컴퓨터의 PCI-card로 작성되었습니다. PC와 컨트롤러간의 통신은 PCI 버스 혹은 RS 232 인터페이스를 통하여 듀얼 포트 램에 쓰여져 일어납니다. 동적인 마이크로 스텝 연산은 고속에서 매우 정밀한 포지셔닝을 가능케 합니다. 컨트롤러와 파워 앰프의 통합은 하나의 플러그 인(plug-in) 장치를 제공하여 컴펙트하게 제공되며, EMC 규격에 따르기 위해 추가적인 기계적 조치를 요구하지 않습니다. LSETP-PCI 는 가격적인 부분이 민감한 어플리케이션에 좋은 대응이 됩니다. 수많은 옵션 기능들은 어떠한 어플리케이션에도 각각의 해결책을 보장해 줍니다. 모터 라이징 포커싱 장치 (MFD : Motorized Focus Device)를 이용하여 Z축에 대해 자동 포커싱 (S/W 사용시) 및 자동 멀티 포커싱을 카능케 합니다. 포커스 드라이브 MFD는 AX, BX, IX시리즈의 현미경에 쉽게 장착할수 있으며 약 0.02 마이크로 미터의 현저한 분해능을 제공합니다. 1축 제어기 ECO-MOT는 전동 포커스 장치 MFD와 함께 사용된다. 최대 포커스 속도는 초당 15회전의 미동 나사 회전이며 최소 포커스 스텝 (분해능)은 약 0.02um 이다. ECO-MOT는 LSETP 컨트롤러와 호환가능하며 대부분의 유명한 영상 분석 패키지와 함께 사용할 수 있다. 수동 포커싱은 패널 앞의 Up/Down 레귤레이터를 통해 수행할 수 있다. SCAN-시리즈 모터 스테이지는 정립 현미경에서 매우 정밀한 샘플 자동 위치 이동 요구에 특히 적합합니다. 최소 75 x 50 mm 에서 최대 600 x 600 mm 의 이송 범위를 가지며 이러한 시스템들은 현미경 검사 이외의 다양한 어플리케이션에서도 신뢰할만한 위치 이동을 수행합니다. 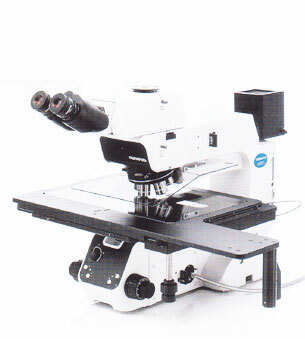 이 스캐닝 스테이지는 도립형 현미경 (Inverted microscope)에 사용하기 위해 특별히 디자인 되었습니다. 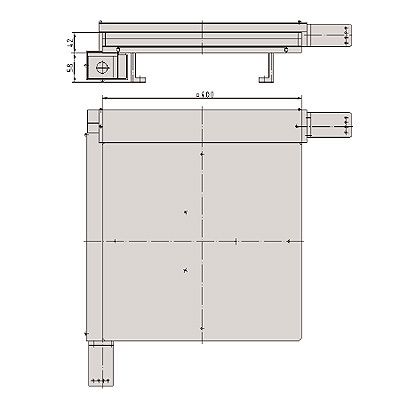 단일 표준 글래스 슬라이드 75 x 25 mm (3″ x 1″)를 위한 인서트 프래임이 각 스테이지에 포함되어 있습니다. SCAN IM 120 x 100 시리즈의 스캐닝 스테이지는 현재 모든 도립형 현미경에 사용 가능합니다. 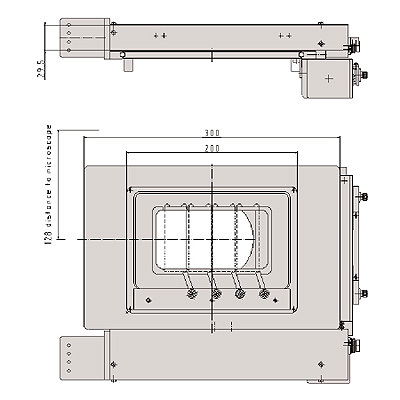 스캐닝 스테이지 SCAN 75 x 50 은 특히 최대 이송 범위 75 x 50 mm (3″ x 2″)의 정밀한 작은 스탭이 요구 되는 Biological 어플리케이션에 추천합니다. 스테이지는 단일 표준 글래스 슬라이드 75 x 25mm (3″ x 1″)를 지지하는 인서트 프레임을 장착할 수 있습니다. 혹은 그 대신 스테이지는 평평한 글래스 플레이트 혹은 메탈 인서트로 교체할 수 있습니다. 이 스캐닝 스테이지는 닫혀있는 금속 플레이트로 구성됩니다. 글래스 플레이트 역시 투과 조명 어플리케이션을 위해 사용가능합니다. 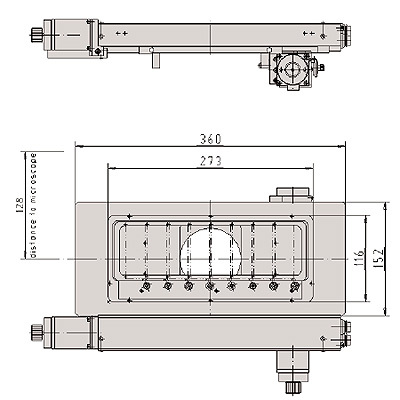 이 모터 스캐닝 스테이지는 자동화된 스캐닝 오퍼레이션을 위해 4개의 표준 슬라이드 76 x 25 mm (3″ x 1″)를 고정하는 특수한 스테이지 인서트를 장착 하였습니다. 최대의 효율을 위해서 두 개의 인서트를 사용하기를 권장합니다. 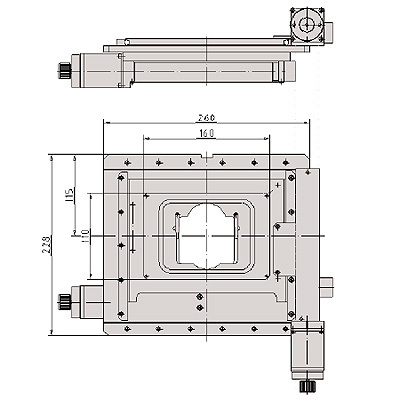 이 모터 스캐닝 스테이지는 자동화된 스캐닝 오퍼레이션을 위해 8개의 표준 슬라이드 76 x 25 mm (3″ x 1″)를 고정하는 특수한 스테이지 인서트를 장착 하였습니다. 최대의 효율을 위해서 두 개의 인서트를 사용하기를 권장합니다. 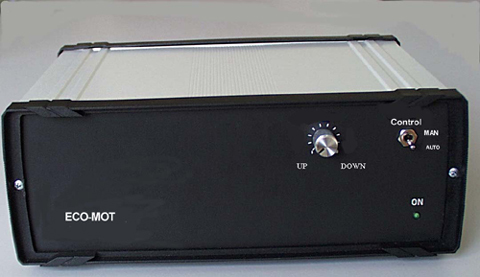 ※ Motorized Stage 제품입니다. 클릭하시면 자세한 내용을 확인하실 수 있습니다.